The True Detective season 3 ending packed a lot in, and actually managed to give us some answers about what happened to the Purcell children. Shockingly, the series even ended with about as close to a happy ending as True Detective gets, as - spoiler alert - the Hays family, complete with newly adopted curmudgeon Roland West, reunites for a slap up meal. For the more pedantic fans though, there were still some questions after the The True Detective season 3 ending that went unanswered. Obviously there are spoilers below too, so make sure you're up-to-date. 1. What happened to Amelia? We find out more about the dramatic events that led to Wayne and Amelia getting together, possibly the only proposal to have "head-shitting bird" as part of its build-up, during the True Detective season 3 ending, but we’re left completely in the dark about the circumstances of her death. Hays is clearly still mourning her in 2015, but he doesn't seem a recent widower, and his conversations with his kids shed little light on the subject. We have to imagine that it was some sort of natural death - any suspicious circumstances and Hayes would be raging, not mourning - but it feels strange that a character so crucial to the story just passes away between timelines with no explanation. 2. Why has Julie continued to live in secret? The trauma of being kidnapped, and her regular doses of lithium at the hands of her crazed captor, mean that Julie's memories of her old life are hazy at best. Still, her new husband Mike must have helped her to fill in any gaps, and with Amelia Hays' book to read, she has a pretty comprehensive timeline of events at her disposable. While the show is very much about her, we never get any real insight into why she's stayed in hiding all this time. Why not bring an end to the speculation, and close the case? What is she still afraid of? Bringing up bad memories? Or that the Hoyt family still has the power to shut her up? We know that not all her memories of her past life are bad though because she named her daughter after her mother, Lucy. 3. Will Henry out Julie if he finds her? By the time Wayne Hays arrives at Julie's home and meets her, his dementia has made him completely forget who she is or why she was there. His son, Henry, takes the piece of paper from him, but doesn't throw it away. Will Henry, also a detective, care enough to follow it up? Might he just pass it on the the host of the Serial style documentary that he got so close to? Is Julie's private peace in danger of being shattered after all? 4. What did the bright white light Wayne enters with Amelia mean? One of the crazier theories about the True Detective season 3 ending is that Wayne Hays is dead the entire time, and the case is a kind of limbo he had to work through. 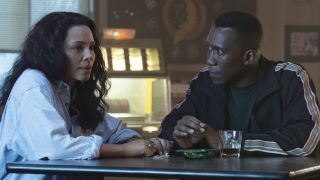 Fans of this theory point to the way that part of the final episode jumps quickly from Amelia and Wayne heading through a bar's doorway into a very heavenly looking light, to Wayne in Vietnam. It's a strange jump - it's not like the series has been heavy-handed with the Vietnam footage - leaving just enough room for fans to hunt for a hidden meaning. What did you think of the big finale? Let us know on Twitter and check out the other series you should be watching with our breakdown of the most anticipated new TV shows coming soon. True Detective is available for digital download now.